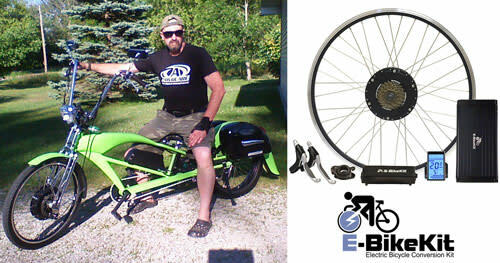 Win an E-BikeKit Conversion System!Winner's choice of model. *Includes 36v10ah Li-ion battery, charger &amp; rear rack! Win an E-BikeKit Conversion System! *Includes 36v10ah Li-ion battery, charger & rear rack! Win an E-BikeKit System valued at $1,361! Share the sweepstakes to increase your odds of winning. *Ships to Contiguous USA and Canada only. Like & Follow E-BikeKit on Facebook! 3. Sweepstakes Period: Entries will be accepted online starting on or about February 1st, 2019 at 12:00 AM EST and ending at July 31st, 2019 at 11:59 PM EST. All online entries must be received by January July 31st, 2019 at 11:59 PM EST. All times are (GMT-05:00) Eastern Time (US & Canada). By entering the Sweepstakes you agree to receive email newsletters periodically from Electric Bike Technologies INC.. You can opt-out of receiving this communication at any time by clicking the unsubscribe link in the newsletter.